With the holidays fast approaching and the kids back in school, it’s a great time to start a routine of healthy exercise before the hectic holiday season hits. Finding the time to work out is a difficulty for most moms but a new trend can turn play time into a quick and effective workout. It’s hula hoops! Celebrities like Beyonce have become addicted to hooping so why not give it a whirl? Hula hooping for an hour will burn as many calories as step aerobics, very brisk walking, and even a boot camp, studies say. The best part is that hula hooping targets your core and just an 8 minute workout can burn up to 50 calories. 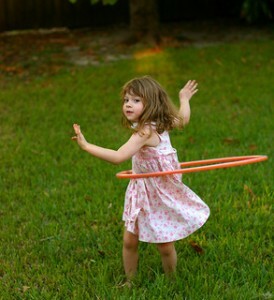 So while you’re playing with your children, why not grab a hoop for this quick workout? Try this routine for a fast, fun, calorie torching time with the kids. Position your feet so one foot is behind you and one is in front. Place the hula hoop in the small of your back and give it a quick push to get it started. To keep hooping, simply shift your weight backwards and forwards. After you’ve got the hang of it, step with your back foot forwards so it’s now the foot in front. If you start to lose the hoop, squat slightly to move your torso lower to speed the hoop up and then return to standing position. Continue stepping forwards and backwards with your feet but start to involve your arms. Start by extending your arms out to the side and on the next step, raise them above your head. It take take practice to get the coordination but just remember to engage your core to push your torso backwards and forwards. Do this for eight minutes and you’ll burn around 50 calories! For more advanced workouts, try using a weighted fitness hoop for more resistance, try moving in different ways, or using the hoop around your arm or leg.